Super Hero Boy: Maukilo offers some of the best toy ideas! Maukilo offers some of the best toy ideas! Maukilo has been one of our favorite new storefronts to visit to just sit and drool at the screen. Owned by one of my favorite eye candy toy companies Haba, Maukilo lives up to its parent company in pure excitement when it comes to looking for some of the coolest toys especially if your a fan of wooden like we are! Maukilo recently sent us over a set of Mini Automoblox to test out. If you've not seen our past reviews on Automoblox let me tell you these cars are super cool and the mini versions lack none of the features that the big ones do, they are just smaller! 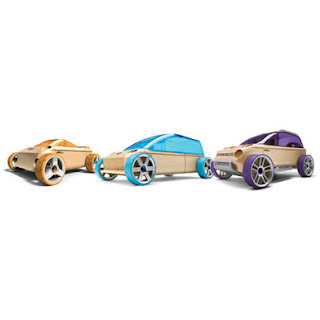 Automoblox feature seek wooden block bodies that come apart and are totally interchangeable. You can remove the front section of the SUV and put it on the van, and so on. As well the tires, hoods, and pretty much all of the parts are removable and interchangeable so children can really make a custom toy all their own. Automoblox themselves look a bit like mini works of art, smooth lines, beautiful little sleek wooden bodies, combined with bright bursts of color really keep them from being an eyesore on your living room floor. The Automoblox minis are the perfect introduction to Automoblox. You get to try out all the features of the standard Automoblox but in a smaller more affordable package. Seeing as the minis come as sets of three you automatically have cars to switch out, trade parts with, and play. All for a little less than the cost of one of the larger Automoblox. As well you can add additonal minis to your collection for $9.99 which is a fraction of the cost of the larger versions that usually run closer to $40 each. What I really love about the minis compared to the larger cars is the are exactly the right size to fit into a toddler sized backpack for travel and are a great size for smaller hands. If your on a budget you can easily afford to add more of these to your collection which makes for customizing your cars even more fun! We tried out the Automoblox Mini Set that includes the A9S Compact, X9x Sport Utlity and M9 Sport Van and absolutely love them. So much so I plan on adding more Automoblox to Connor's collection hopefully for his birthday! Maukilo offers so much more than Automoblox though. They offer the biggest collection of Haba toys I've seen, a must see if you head over there for children of all ages as they have some really cool and unique board games that must be viewed. As well as an awesome collection of wooden toys which every time I go over there to check out I spend half the day making a wish list three pages long. You should also check out the daily steal which changes quite regularly and offers awesome toys ate massive discounts! Maukilo was generous enough to offer one of our readers a $25 gift certificate to be used on anything in the store. If you win you can keep it for yourself or give it as a gift! You really can't loose. I can think of at least a dozen things I'd want to buy if we had one! Maukilo and let us know what you'd spend your $25 gift certificate on if you won! There is so much great stuff but this caught my eye! I love the HABA Flower Fairies Tableware Set on special!! If I won, I would get the HABA Bunny Molly Cuddlekin. I love the Pushing Car Walker Wagon! I would use the $25 on a Rody Horse. Paige would have so much fun with one of those bad boys! I like the HABA Advent Calendar Christmas Decoration - reusable, refillable, recyclable!! I would love to use it to help buy a Ball Track System by HABA. My kids love marble runs and they have a great selection. I like the HABA Seating Cube Pirates treasure. I would get the Castle Knights Game - CLEARANCE - cooperative building game. I would definitely get the HABA Max Stroller Toy for my son. I'd probably get the Sounds Like Fun Shake and Strum- natural wood violin with rattling sound. Thanks. The Activity Clock is really neat. Thanks for the chance. The Dancing alligator pull toy would be my choice. I would get the Animal Den Play Ball with Rustling Foil and Squeaker. Thanks! I'd get The Orchard Card Game & The Lucky Sock Dip Game. Thanks for the chance! My kids would have fun with the Castle Knights Game! I like the game Knights of the Round Numbers. I would start with the Dancing Alligator. I would get the Haba Romantic Block Set. I would love to get the Animal Upon Animal Game - wobbly stacking game, thanks! I love the Skull and Cross Bones Diamond Kite. I'd get one for each of my kids at such a great price! At Maukilo, I like the Blossom Sky Play Tent for my daughter. I like the HABA Toys Carpenter Pixie Walker Wagon. Most likely put it towards getting a Rody for my lil one... To darn cute. I would get the Cat Kiki Cuddling Muslin with teething ring. I'd love to get the HABA Hodgepodge Puzzle Cubes for my baby nephew! I'd have a hard time narrowing it down, because Maukilo does have an AWESOME collection of the TOP BRANDS and Toys. Thank you Maukilo and Seven Dogs and A Baby. My son would love the A9S Compact. The HABA Flower Fairies Tableware Set looks very nice!